Deep Cleanings might sound like a treatment that is needed after you missed a couple of your dental visits. That is not the case, deep cleanings are needed to treat patients that have periodontal disease. Periodontal disease is bacteria that attacks the gums. This causes the gums and soft tissues to turn red, bleeding of the gums, bad breathe, and if it is severe you can lose teeth. Brushing and flossing correctly will help prevent periodontal disease. 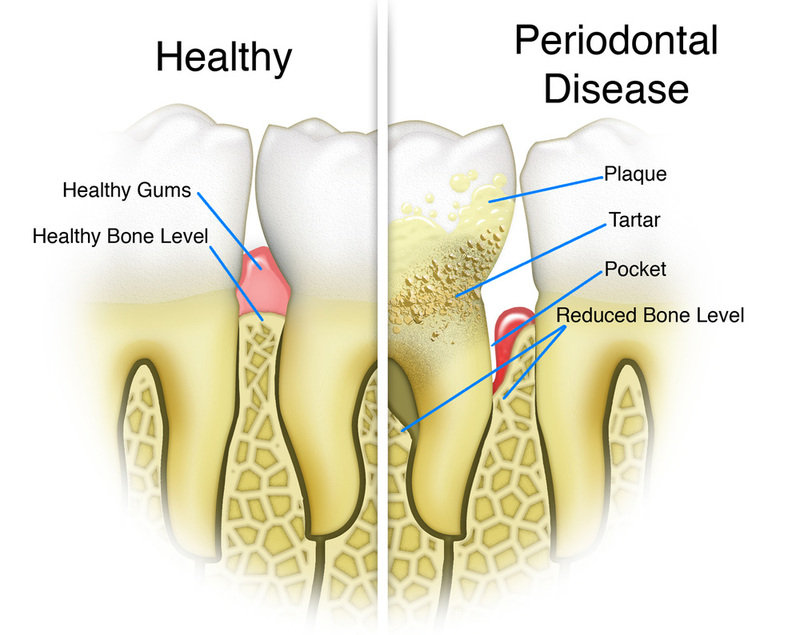 One question that is often asked when someone is diagnose with periodontal disease is, can I just get a regular cleaning? Regular cleanings will not help your periodontal disease. Regular cleaning is cleaning the coronal portion of the tooth, the bacteria and build up that causes the periodontal disease is beneath the gum level. How do I know if I have periodontal disease? It starts with a dental exam, x-rays are taken and then the dentist begins your exam. Dentist can diagnose by measuring the pockets of your gums with a dental probe. If the probe indicates 3mm pockets or deeper than that is a sign of periodontal disease. Another way dentist can diagnose is by x-rays and seeing the bone level. What happens after I’m diagnose with periodontal disease? After being diagnose with periodontal disease then the next step will be, scaling and root planning (deep cleaning). Scaling would be scraping all the buildup or tartar beneath the gum level. Root planning is removing rough spots on the root of the teeth. There is different antibiotics that can be prescribe after treatment to help periodontal disease. After the treatment it is normal for patients to feel sensitivity for a few weeks. This should get better during time passes, if not you would need to contact your treating dentist to find a solution. Scheduling periodontal maintenance appointments every 3 months after the first cleaning is very important, in this step the dentist will check the gum levels by measuring the pockets to see if the condition is getting better or worse. It is very important to brush and floss daily to prevent periodontal disease. This entry was posted in Uncategorized and tagged Deep Cleaning, santa ana dentist, Smiles on Bristol on November 25, 2015 by Francisco Torres.